GE's WWSE5240 offers various features that make washing a more bearable task, even for people who always seem to be on the go. This top-loading washer features a 3.2 cu. ft. Super Plus ExtraAction Wash Basket, which can accommodate a decent load of laundry. This loading capacity is ideal for those who do their laundry weekly or have drapes and bedding to wash before the start of a week. The wash basket provides more than enough surface area, which aids in the squeezing of more water from clothes during the spin cycle. Through this, the dry time of the fabric is significantly reduced. With up to 24 wash cycles, this top loader gives users more control over the outcome of the laundry. The five wash/spin speed combinations also helps in customizing the wash depending on the kind of laundry items. With this feature, users don't have to worry too much about loading laundry items with delicate fabric such as towels and swimsuits. The washer ensures that the wash/spin matches the type of the fabric being washed. The washer's HydroWave wash system also seals a good deal for fabric care. This feature allows the clothes to travel through the water longer and slower, so the laundry items will be thoroughly cleaned. This process also proves to be gentler on clothes. For users who worry about the wear and tear of their clothing, the solution is on the washer's four wash/rinse temperatures options, which set the exact temperature to reduce wear while effectively removing dirt and germs. Even though GE's WWSE5240 is a top loader, it has a four water level feature that offers users the chance to save on energy and water. 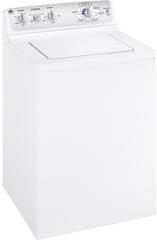 GE's WWSE5240 have the necessary features that make up for thorough laundry cleaning. Though the wash action of this washer is tough on germs and dirt, it doesn't ruin the fabric quality. The basic settings are designed to suit different types of clothing as well as light to heavy laundry items such as comforters and bedsheets. Many consumers agree that one of the best features of this washer is its large loading capacity. This washer can accommodate more, thereby reducing the time alloted for laundry washing. As a result, users can save on electricity. The water level option is also an added advantage for users as it allows them to have control on the energy and water to be spent in washing. Some users like this machine because it is easy to install compared with other top load washers. The control settings are also fairly easy to understand. Many users claim that the WWSE5240 is good when it comes to cleaning clothes. Its HydroWave wash system and five wash/spin speed combinations clean the laundry items well, and at the same time, make sures that the materials are carefully taken care of. This washing machine also has a feature that reduces the drying time of the laundry. One of the drawbacks of buying this washer is its price. According to some consumers, this top loader is relatively expensive than other top-loading washers with the same capacity. For some shoppers who are into style and design, this washer's major disadvantage is its lack of design variety. Although this product is said to be energy-efficient, consumers are cynical about this claim. For them, the fact that this washer uses an agitator simply means that it can't be as energy-saving as other washing machines. Other consumers also disproved the claim that this washer is durable. Some said that, after just a few months of using, this washer is prone to breakage and requires repair. Although GE's WWSE5240 has its own limitations, it is fair to say that it still has lots of advantages to offer to consumers. It is a fact that top loaders could not always match the efficiency and features of front loaders. But much of their appeal to consumers come from their cheaper price. Though some consider this washer to be a bit pricey, when it comes to cleaning, it performs better than other top loaders. I bought this washer a year ago (used) and it stopped agitating and spinning. Told by the repair service, that it was the computer board in the motor and that I'd be better off buying a new washer for the price it would cost to fix it. He also told me that even if I were to fix it, that more than likely the washer would start having other problems. Bought this washer less than 3 years ago. It has had to have a new motor, fuse and now it needs a new water level switch. First repair visit was under warranty but not the last two. Decided after much conversations with a few places that I'd rather purchase a new washer. Was told this will be a money pit for repairs. By the way I only wash clothes once a week and only have 3 loads to do! bought this washer in july 2008. guess what--service man was here today-- the drum is dropping to the floor and the drum is "banging" so loud right now cause it is dropping. would not buy again!!!! Still into my 90 day warrentory which was extended to 3 years... have yet to have a problem. LOVE this washer! (First and best one I have ever owned) Granted, this washer was for the second living area in a 7000sqft home, it is spinning the crap out of others. NOW! How do I geet a clear cover for this washer? and if possible a clear door for the matching GAS dryer?